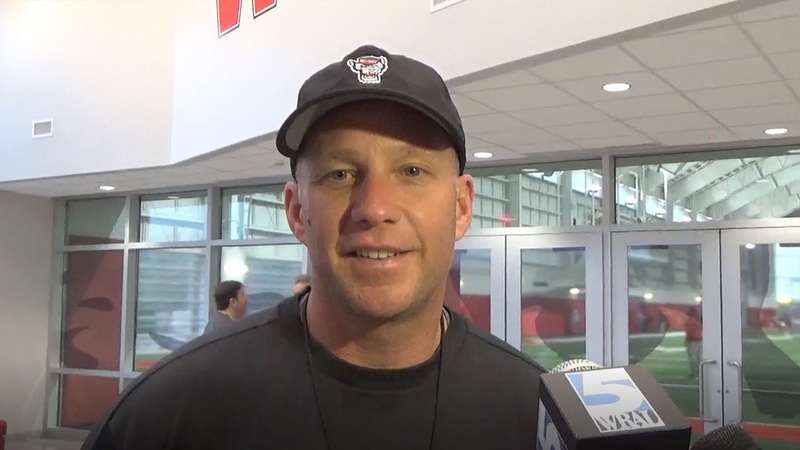 Dave Doeren: "I Love Where I'm At"
NC State head coach Dave Doeren met with the media today to discuss spring practice. He touched on a variety of topics, ranging from Jarius Morehead to his new contract. NOTE: Click the video agvoe to watch the interview. Jarius was a good two-way player in high school and a really good person and in-state guy. We just felt like we can’t, in the stage we were in as a program, say no to a great in-state player that can play multiple positions, especially with his character and makeup. Did it help out at all with the Holt brothers, Debbie Yow... ties to the area, that he’d understand about being a Wolfpacker? At the time, I didn’t probably understand that as much as I do now. There are certain areas of the state that are seriously red, and that’s one of them because of what we’ve had through that school, so that does help. Is there any indication on who will wear No. 1 this year? Not to be made public yet. Who has the leg up on the quarterback competition right now? Is it going to be a whole different world for Emeka Emezie becoming that No. 1 starter? It could be. That’s one of the guys that’s like those guys that just left that just grinds, and so where he stands today is not where he stands in August. He’s going to work as hard as anybody in the country this summer. That’s how just how these guys are wired in Coach McDonald’s room, and I expect him to be ready for that opportunity. What areas have you seen him improve this spring? Consistency. He’s grown up a lot in his ability to handle a bad play. Jakobi struggled with that early in his career, too, where he’d get really down on himself. Your ability to bounce back and just make up for it, I think you’ve seen that with him now. What does that contract being finalized mean for you as far as being comfortable with your team and program? It means the world to me and my family. I love where I’m at. My sons and my wife, we’re all happy. This is home to us. I can recruit with a five-year contract. It makes a big difference. We had three commitments within 48 hours of that announcement. You can see how that helps in recruiting, for our players, and the parents of our players with the peace of mind that their sons are going to be with the staff that recruited them. I think it matters a lot. Hopefully DD is here for the long hall. Really like him and what he has done... I know that this year is a rebuild but I think we are fine. Here's to Coach and his family calling Raleigh home for many years to come. We want to keep them happy and we anticipate that will lead to lots of great Wolfpack football success. Happy coach, happy family, happy players, and happy fans. Keep building, Coach!